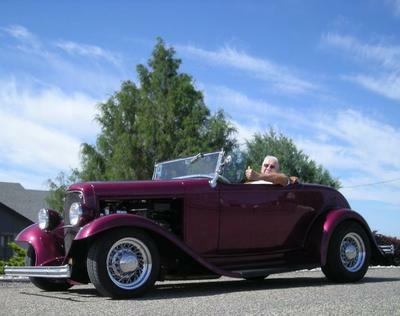 8/7/2015 Ontario, Oregon - 1932 Ford Roadster w/350/4L60&8" 3:56 gears. One of the the very early Downs bodies and frame. 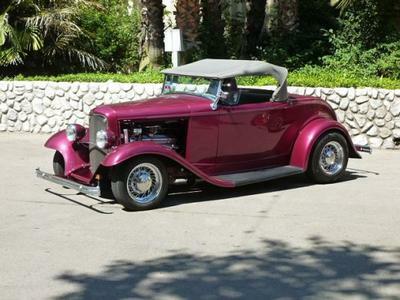 Good cruising roadster w/LeBaron Bonney folding top. Base coat clear coat deep iris metallic paint w/ghost flames. Vintage AC and heat and Walker radiator. 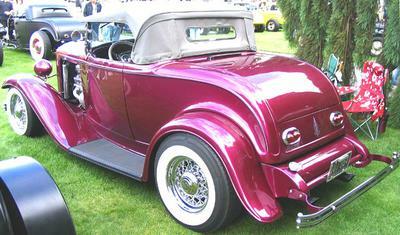 Metal grille and shell and one piece hood top and metal running boards with rubber covers. This car has won numerous trophies.